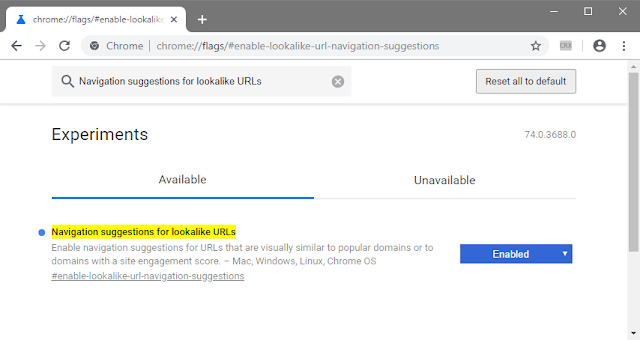 Google is working on the introduction of autosuggestion for lookalike URLs on Chrome browser, with the aim of warning users when accessing a possible clone website, which are often coded with malicious intent to trick users into entering their personal or banking details. 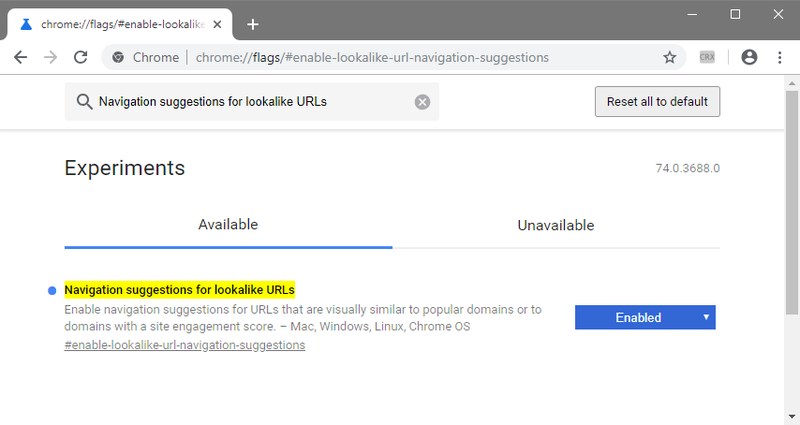 Starting with the release of Chrome Canary 70, Google has been testing a feature called "Navigation suggestions for lookalike URLs" - Chrome Canary been Google's testing ground for new features on Chrome - the feature when live will attempt to correct users who misspell's a website’s name in the Chrome Omnibox. The feature which is now only available for Chrome Canary users, can simply be enabled by typing “chrome://flags/#enable-lookalike-url-navigation-suggestions” in the Omnibox. While the flag is present in the stable version of Chrome, it is not working as at the time of the post, which possibly means Google is still fine-tuning the feature before enabling it on the stable version. Google's effort to make Chrome safer for users surfing the Web also led to the earlier introduction of some basic antivirus features last year, with the Chrome Cleanup Tool (CCT) for Windows which runs on ESET’s antivirus engine. Though the Chrome Cleanup Tool is not a general purpose anti-virus, its sole purpose is to detect and remove unwanted software that could affect the browser's performance. Google is poised to continue making massive improvements to the browser for better security and ultimately the best web experience.